The Jogging Buddy was designed for the night-time jogger. It has since found its way into all walks of life. The handle is made of solid brass, which makes it a very attractive jogging partner. Click here to order a Jogging Buddy. Click here to order a Shoe Horn. This is one of our more unique items. It's a great companion for any hiker. Each hiking staff features an authentic elk antler handle. A leather thong is attached to the staff to secure to the wrist. Use for balance or to ward off unwelcomed intruders. (snakes, raccoons, etc.). 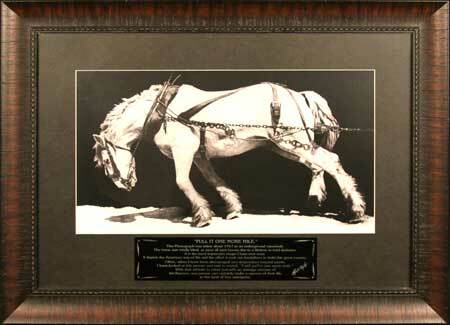 Framed Horse Print - "Pull It One More Mile." "PULL IT ONE MORE MILE"
This photograph was taken about 1917 in an underground mine shaft. This horse was totally blind, as were all such horses due to a lifetime in total darkness. It is the most impressive image I have ever seen. It depicts the American way of life and the effort it took our forefathers to build this great country. Often, when I have been discouraged and despondent beyond words, I have looked at this picture and said to myself, "I will pull it one more mile." With that attitude in mind and with an average amount of intelligence, any person can certainly make a success of their life in this land of free enterprise. Click here to order the Horse Print.